Image caption Haruki Murakami: Someday his prize will come? And this year's Nobel Prize for literature goes to... someone who's not Haruki Murakami again. The BBC delves into the dejected world of his long-suffering fans whose sole desire - to see the Japanese writer win the prize - is thwarted every year. Known for his pensive philosophical novels, Murakami is Japan's most internationally renowned author right now. For years, many in Japan have hoped he would clinch the biggest prize in literature, and waiting for the Nobel announcement has become an annual, and heavily reported, ritual. Cue the "Harukists" - acolytes who would gather across the country to peruse their dog-eared copies of Murakami's books, sip on whisky (a motif in his writing) with jazz playing in the background (also a motif), all under the spotlight of television cameras. At one such gathering on Thursday night at a Tokyo shrine, about 200 "Harukists", surrounded by reporters, readied their celebratory party poppers in anticipation, while watching a livestream of the announcement. But it was not to be - British writer Kazuo Ishiguro was declared the winner instead. A chorus of sighs erupted from the crowd which, after a beat, burst into polite applause, reported newspaper Mainichi Shimbun. It was slightly more embarrassing for staff at Tokyo's flagship Kinokuniya bookshop, who had lovingly laid out more than 30 titles of Murakami's books in a special display. After they let out a loud surprised "Ohhh", staff quickly dismantled their Murakami corner and replaced it with their handful of copies of Ishiguro's books while rushing to order more, according to Asahi Shimbun. Meanwhile, Ishiguro's Japanese publisher tweeted (in Japanese): "We're all flustered." 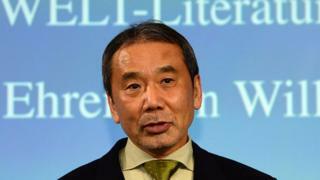 On the Nobel Prize Committee's Facebook page, some were quick to make a dig at Murakami fans. Murakami's yearly non-win has now become something of a running joke to the rest of the Japanese public - many say autumn hasn't started in Japan if Murakami hasn't lost once again. "When Haruki Murakami loses out on the Nobel literature prize and Harukists around the country all fall to their knees in disappointment, I feel autumn has come," joked one Twitter user yesterday. How did Murakami conquer the world? These include actors Amy Adams and the late Peter O'Toole (though he did get an honorary Oscar), as well as singers Björk and Katy Perry. But cheer up Murakami fans, hope springs eternal - after all, Leonardo DiCaprio won an Oscar last year after a 23-year wait. But it's still okay right, because the Nobel winner's Japanese... or is he? 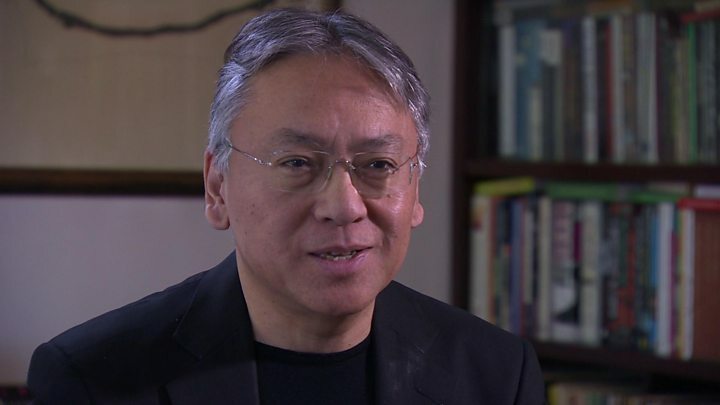 Ishiguro, a British citizen who writes in English, was born in Japan and moved to the UK when he was five. Still, that hasn't stopped some in Japan from claiming him as their own. The newspaper Sankei proclaimed him the "third Japan-born literary laureate", after Yasunari Kawabata and Kenzaburo Oe. Meanwhile other outlets have zoomed in on how Ishiguro - who has written two books linked to Japan - has talked about the importance of his Japanese identity. Bookshop owner Tasuku Saito told Nikkan Sports he was disappointed by Murakami's loss, but added he accepted Ishiguro's win as it's "someone with Japanese blood in him". But it's also sparked a backlash online, where some have criticised the double standards in embracing a Japanese raised abroad, given recent controversies over mixed-race citizens such as politician Renho. "Kazuo Ishiguro was raised in Britain and has British citizenship, but we call him the third Japanese laureate. On the other hand... Renho, who was born and raised in Japan and has Japanese citizenship, we look down upon her.... Japan is a shameful country," said Twitter user 1957ry.